Why do I need a campus lightning policy? There’s a lot of safety concerns at colleges and universities. Campus security, mental health, and transportation are popular topics among campus administrators, emergency managers, and security directors. However, there is only one threat that can affect students while in their dorms, classes, playing sports, or attending events. That danger is severe weather. Lightning on campus is a constant threat. The problem is many campus officials overlook it because of the complexity of campus health and safety in general. Managing safety or operations is not an easy task, but neither is dealing with the tragedy of losing a student, faculty member, or visitor to lightning when there is so much technology out there to prevent such a loss. We’ve compiled a list of the 8 campus lighting policy best practices that will increase preparedness, safety, and overall well-being at your campus. The first best practice is to actually have a complete lightning policy drafted up. This is a lightning policy that covers all campus operations – not just athletic events. This should be a written policy with procedures for when lightning is observed and strict rules. This policy should also outline which technology campus officials will use to keep track of lightning. The best practice for lightning safety in any industry is to use lightning detection rather than lightning prediction. There is a big difference between the two. Lightning detection actual detects strikes while prediction merely measures nearby electrostatic discharges. Unfortunately, lightning prediction systems can mistake ambient charges as lightning. They also can’t access a network of sensors to get the “big picture.” Investing in lightning detection is smarter, easier to maintain, and has a higher ROI when it comes to safety. The second best practice is to have an unmistakable outdoor lightning alert system. 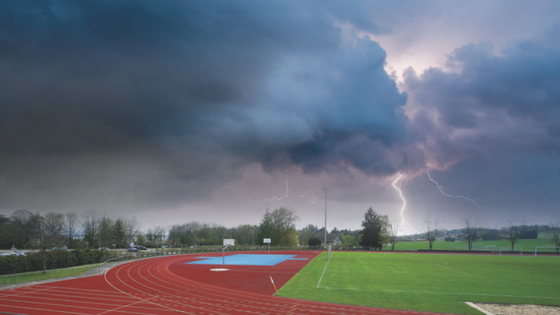 An outdoor alerting system is your campus’ best bet in a number of severe weather situations. Imagine an outdoor graduation ceremony filled with thousands of people who are unfamiliar with campus. An impending storm is on the way and campus officials responsible for severe weather safety must help this large group to safety. This requires loud outdoor alerts with the longest lead times available for all guests, grads, and employees to seek shelter. After ensuring you have outdoor lightning alerts, you also need to have indoor lightning alerts. Many people think they are safe from lightning indoors. That is a myth. While entering grounded shelters with a roof and four walls are the safest place to be during a thunderstorm, it is not full proof. For example, open windows and doors can put you at risk for a lightning strike. Also, direct strikes can set buildings on fire. They can also travel through piping and electrocute people using plumbing. This goes for indoor athletics as well. Indoor swimming pools are especially dangerous. If a thunderstorm is within striking distance, indoor swimming pools need to be evacuated. 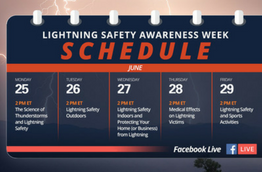 A great way to disseminate indoor lightning alerts is with a mobile application. Mobile alerts that are the most effective include alerts for your specific area with parameters and settings you can pick yourself. Let’s say you want to know when lightning is within 15 miles of your aquatics area. You should have a mobile alert application that can be set for those specific parameters. The next best practice is all about the data. 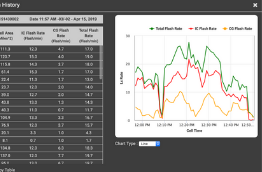 Both outdoor and indoor alerting systems are only as effective as the data that’s powering them. The best practice is lightning monitoring is using total lightning. Total lightning is the combination of cloud-to-ground lightning strikes and in-cloud lightning strikes. It’s critical to ensure that your weather alert systems use total lightning because many only use cloud-to-ground. While cloud-to-ground strikes are often the ones that damage property and injure people, they aren’t the most common type of discharge. 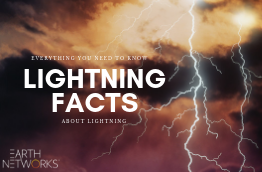 In-cloud lightning makes up nearly 80% of all lightning strikes. It’s necessary for accurate, real-time lightning detection because it makes up the majority and helps predict other forms of severe weather like hail, tornadoes, and high winds. 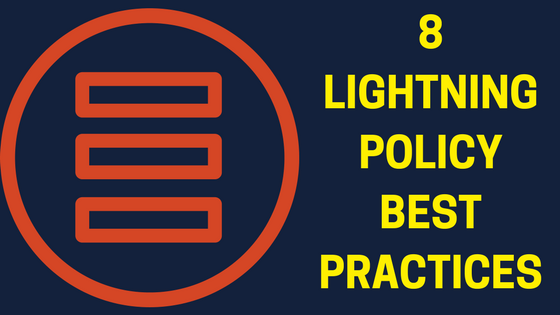 The fifth campus lightning policy best practice on our list it to automate decisions. Weather-related decision-making is extremely difficult for a couple of different reasons. First of all, the weather itself is subject to change. The second a forecast is broadcasted it becomes old news. It’s hard for someone to make a decision based on old data. The second reason why it’s so difficult is that there is a lot of pressure – Especially when sporting events are involved. There are a lot of different people who worry more about getting the game in then actually ensuring safety during the game. Being the decision-maker in this situation is not fun because it’s a double-edged sword. If you call the game off and there isn’t a storm you risk everyone not taking severe weather alerts seriously and getting angry with the school. If you don’t call the game off and a severe storm hits, you risk injuring your players, staff, and fans. Take the human risk and the pressure out of this situation by relying on automated decisions from a weather provider or alerting system. All of these collaboration avenues help keep critical emergency management personnel as well as students and staff tuned into developing lighting situations. The next campus lightning policy best practice on our list is to remind visitors. Remember the visitors at the graduation ceremony from the beginning of this guide? They will be safer if they are reminded of your campus’ lightning policies before emergency strikes. Before any game, ceremony, or event, it is best practice to remind visitors of the alerting systems available and the correct protocol if lightning becomes an issue. Even by following every best practice on this list, campuses still need to stay alert to stay safe. Staff and students alike should be vigilant when it comes to severe weather. That means never ignoring an alert and taking the threat of lightning and other forms of severe weather seriously.